This entry was posted in Desserts and tagged Brownie Recipe, Chia Brownie Recipe, chia seeds, Chocolate Brownies Vegan Recipe, cocoa powder, crunchy peanut butter, Dairy-free and Gluten-free dessert recipe, Dairy-free Brownie Recipe, Flourless Peanut Butter Chocolate Brownies Recipe, Healthy Brownie Recipe, Honey Brownies, Peanut Butter, Vegan Peanut Butter Brownies by Balanced Modern Mom. Bookmark the permalink. This looks so delicious! can’t wait to try it out. Thank you. They are let me know how you like them. I have a feeling these will be the star of the Lenten potlucks I attend this year. They should be they are that good. Exercise caution because these are so addictive. Ha! added seeds to IQ grocery list! That’s great if you want you can use just flax seeds or just chia seeds. I ground both and used both but it’s optional. Enjoy and let me know how you liked them. Reblogged this on Cooking With No Time. I am excited to give this a shot too! Thanks for sharing! Awe! Thanks and have a great weekend too! Thank you for stopping by mythineats and whipping up one of my delicious recipes. How much calories do you think this would be per serving? Working on losing weight (check out my blog by the way! 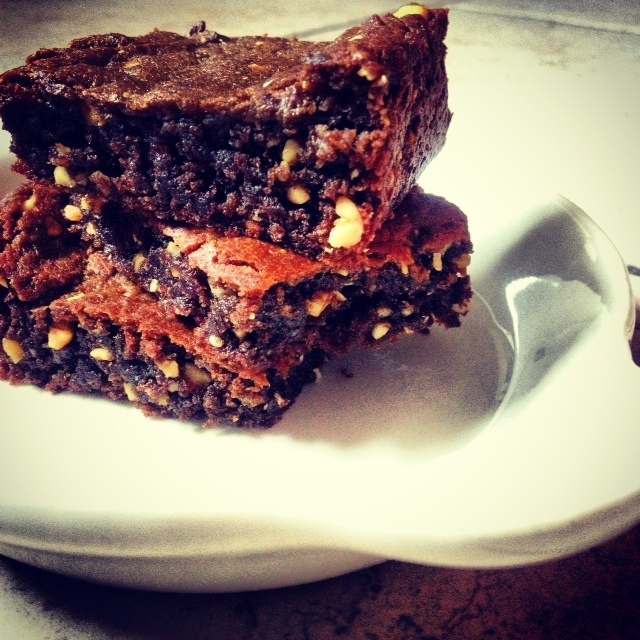 myweightolose.com) and your ingredients look much healthier of a choice than peanut butter brownies store bought. I don’t know exact Calories but my estimation would be about 100-115 calories x square. However, keep in mind that this is a healthy substitution and the chia seeds will make you feel full with just about one brownie. Yum! It looks and sounds delicious. I’m definitely with you on the crunchy peanut butter too! Yes crunch is the best! I love it.